These are some of the lovely and hard-working girls in our education program in Quang Nam. They have differing family circumstances, but all can't afford to continue their education without financial support due to the low income of those caring for them. Ly's mother left her with her grandparents when she was very young and she is still angry with her for leaving her, and not returning for her. Her grandparents are elderly and granddad used to sell lottery tickets when he felt well enough, but now he rarely sells. She is a tomboy and is quite a tempestuous young lady. She has been sponsored for nine years now and is doing well at school. 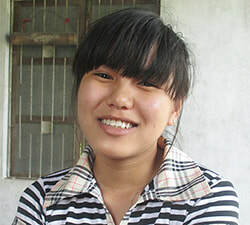 Minh has one sister who also was sponsored by CEF to study accountancy. She successfully completed her college course and is working now and helping to support her mother, sister and uncle. She and her sister live with their mentally ill uncle and their single mother. 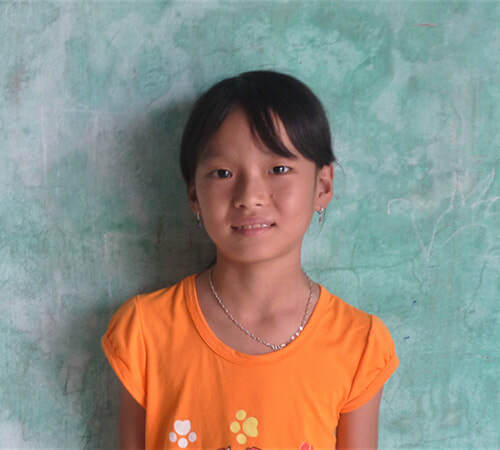 Minh has been sponsored five years, is an excellent student. Her teachers are very proud of her and enter her in education competitions. 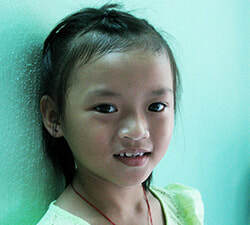 Nhu is an orphan and lives with granny and auntie in the hall of a government apartment block. They live here while they wait for the local government to release some land for them to live on. 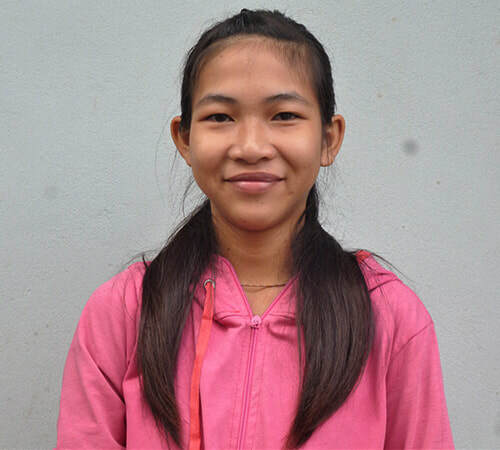 Nhu has been sponsored seven years and has done quite well in school, although her results suffered when she was emotionally at a low for a couple of years. 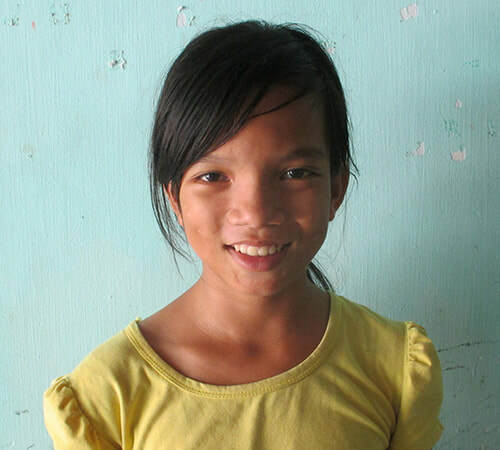 Tuyen's parents are both blind and dad works full time as a massage therapist earning about $1 a day. Mum hasn't good health and stays at home to look after Tuyen. Tuyen's grandparents live next door and help out when need be. 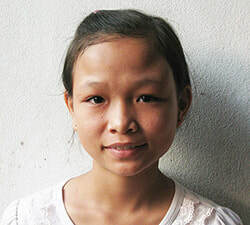 Tuyen has been sponsored for six years and wasn't doing very well at school because she didn't have anyone at home to help her with home work. We found a tutor nearby who has been helping her for three years, kindly funded by her sponsor. Ha's father died and her mother now lives in HCM City with some of her siblings. Mum sells food there and sends a little money home each month to feed Ha. Ha moves between two homes; the home of one granny and that of her other grandparents. Ha who has been sponsored for six years and is a very sweet, thoughtful and helpful girl. She also works very hard and is an excellent student. 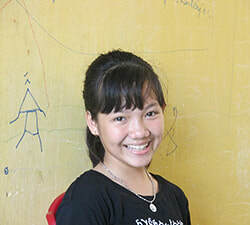 She hopes to go to university in Ho Chi Minh City and live with her mother there. 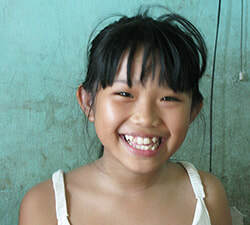 Thuy lives with her granny, disabled aunt and her cousin. Her cousin's mother who helps to support her sometimes comes home for a few days when she can get time off from work. Her father died and mum remarried and she has not seen her much. 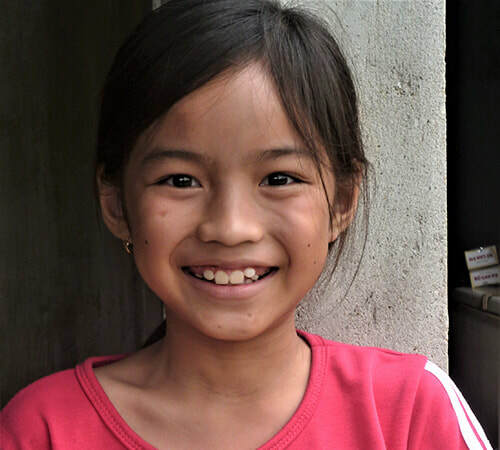 Thuy works very hard at school, but her results suffer because she has little time for homework; she helps her aunt and uncle who live next door with childcare as they help support her a little. Vy's mother died of stomach cancer a few years ago and since then she lived with dad when he was not away working. When he was away she moves from one aunt's home to another, as none of the situations worked out well. She is a sweet girl whose school results suffered for a couple of years with all the insecurity she was going through and the restrictions on her use of electricity in the evening for study purposes. Sadly her dad died recently and now she lives alone sometimes and a brother and an aunt take it in turns helping care for her. Dieu's parents drowned. Since then she and until four years ago she lived with her brother and sister and elderly grandparents who are sweet and caring. Due to their advanced years and fragility, she looks after them more than they look after her. Her sister also received educational support from CEF to complete high school and attend college and lived at home until she married recently and now lives near by. Her brother has been at university and soon completes his degree. Dieu has been sponsored for eight years and is doing well at school. My Nhu lives with granddad and her mentally ill aunt who is in her 40's. Granny died before she was born. Her father died in an accident when she was a baby and mum remarried and moved to the south of Vietnam when she was in grade 1. She has not seen her mother since then. My Nhu helps her granddad with cooking and domestic chores. Over the last two years her results have suffered due to too much time on her phone. 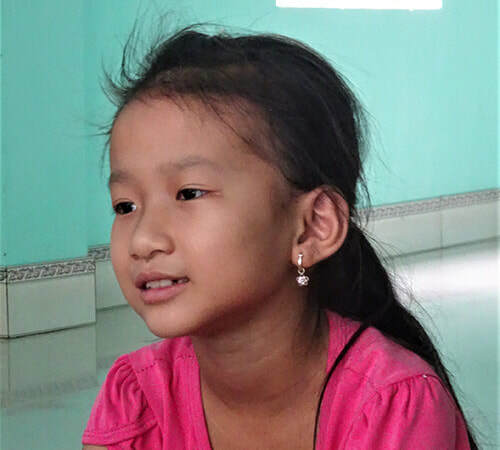 Trinh was a weak, unhealthy and frightened toddler when we first met her. Over the years she has gained both weight and confidence. She lives with granddad and an auntie. Mum died from brain cancer five years ago and granny passed away soon after. 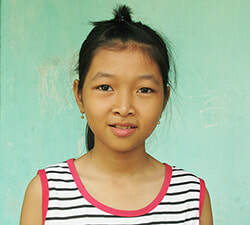 Trinh who has been sponsored five years now and loves school, but due to no one being able to help her with homework she isn't doing well in school. Phuong Linh lost her father recently after he had a stroke. She’s only 12 but shows a maturity beyond her age. She asked her extra tuition teachers to reduce the fees they charge to help her mother and she’s learning to do more around the house. She’s a hard worker in class too, often complimented by her teachers. Her only dream is for her mother to live a long and healthy life. Dung was living with her mum, elderly granny and auntie when we first met her. Five years ago she moved into boarding rooms to be in a position to attend high school, as there was no high school near her family home. She adjusted well, worked hard, and did just as well in high school as she did in secondary school. She is just finishing her first year at university where she is studying construction finance. 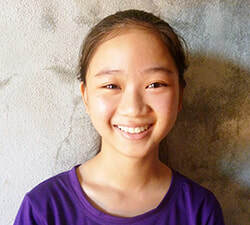 Hien is a bubbly girl and loves singing and has a strong desire to be a professional singer. She lives with mum and her elderly granny who both have poor health. Mum works in a factory and granny is too old to work, but helps out at home. She loves school and is doing well. Hien requested English classes as she wanted to communicate with the English-speaking children in her neighbourhood. She was thrilled when we told her of free classes she could attend at STEC, a local English language centre and is doing very well there. Nga's father only does domestic chores because of serious back injury and mum works in a factory. Nga was excited recently because her mother had bought a cooking stove. Now she no longer has to cook for her family on a wood fire, giving her more free time for her home work, enabling her to maintain her ongoing very high standard. She is such a 'bright' student that she will be going to an advanced high school. Tuyet Trinh is a quiet young lady. She was hard-working at school and consequently always had excellent results even though she helped her mother with her work for a couple of hours a day. Her mother makes a meagre living from selling rice porridge early each morning and then makes small colourful lanterns with silk threads during the remainder of the day. 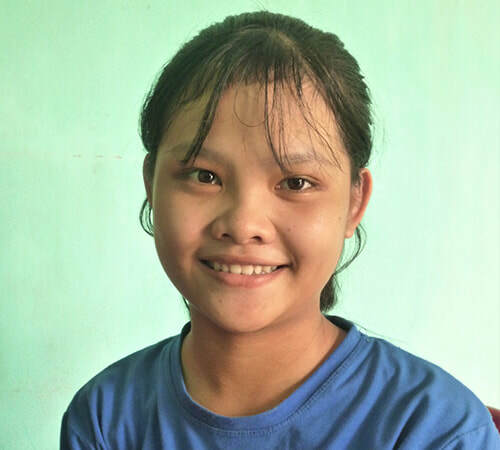 Trinh who was sponsored for five years is now studying psychology at university in Ho Chi Minh City. She was successful at obtaining two grants for her university studies. Diem Quynh has a lot of character and is full of energy. Having HIV doesn't seem to impact her present day life in any obvious way except she has to take her medications at set times and have regular health checks. Both her parents and have passed away from HIV. From when she was born she has lived with her grandparents and one cousin. Granny is a farmer and garbage collector who works hard to support the family. Quynh loves school mainly for the friendships and art. 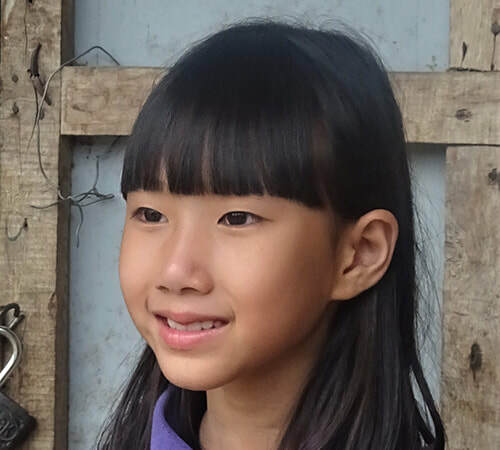 Thuy Van is a hard working and clever girl who is doing really well at school. When not at school or doing home work she helps her mother around the house. Her father died suddenly from a stroke although he had stopped working and was taking it easy as he was told he had congenital heart disease. Mum does whatever work she can get to support her two children and at present grows vegetables, sells vegetables from her bike each morning and cares for someone else's acacia trees. Dieu Huyen loves school and after graduation she plans to be a modern farmer using modern farming techniques and equipment. That is a long way off as she is still in primary school. ​Dad has been looking after three children since mum died from brain injury as the result of a serious motorbike accident. She had emergency brain surgery but it wasn't soon enough to save her life. Huyen Vi's parents divorced a few years ago and dad remarried. Mum works away from home doing two jobs to earn enough to support her mother and youngest child, Vi who lives with granny. Mum sells coffee in the early morning then has a cleaning job in a hotel for the remainder of the day. Vi dreams of being a physical education teacher so she can teach young people how to stay healthy and how to get enough of the right exercise. Her mother is very caring and spends a lot of time helping her with her school work. This has resulted in her doing well at school. Her mother used to work, but got weaker and lost a lot of weight. Nowadays she has no income as no one will employ her so she helps her relatives and cares for her daughter and the family help support the two of them even though poor themselves. Thanh Thoa lives and eats with her grandmother as mum doesn't want to risk Thao getting infected. Her mother has HIV and dad has passed away. 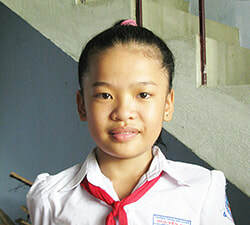 Lan is a sweet girl and is doing very well in school. She is unusual as ethics is her favourite subject as she loves to solve ethical problems. In literature classes she loves writing about and describing trees. Her mum works in a factory and earns very little and can't afford to support her four children. When her parents divorced she went to live with her paternal grandparents with her brothers. Mum and her sister live with the maternal grandparents. Soon after the divorce dad was killed by a drunk stranger. Dad died a few months ago from a lung infection, possibly from aspestosis, as well as kidney failure. He had been a construction worker for his working life and his health had been suffering for many years. Since dad died this little primary school child has learned to look after herself more and can do cleaning such as mopping and can wash her own clothes. Her biggest dream is to stay in school a long time. Her mother sells snails each morning in the hope of earning enough to support her three children. She wants them to all be well educated so they can have a good income. Nhu Quyn lives with her father, two brothers and grandfather. Dad is a rice farmer and works in a rice mill too. Grandad makes money from using the front room for motorbike parking. As there is no woman in the house Quynh does the housework and most of the cooking. This is understandable but unfortunately it affects her results. Mum and granny live together as mum has terminal cancer and granny helps to care for her. 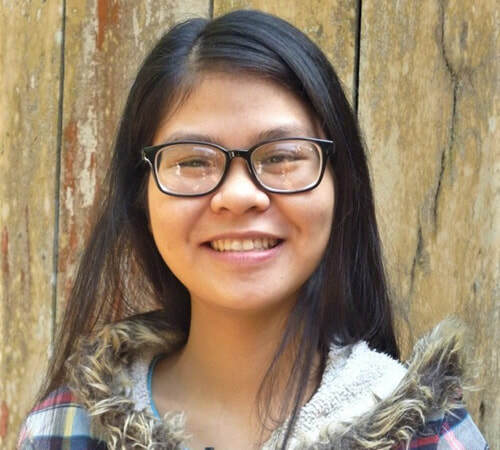 Thao is a sweet, shy and very quiet girl. She loves school, especially literature as it helps her get in touch with her feelings. Sadly one of her older sisters killed herself due to the effect their poverty had on her and her education. Since then the parents have been very aware of how their children are feeling and do whatever they can to ensure they have the educational support they need. They only have a small amount of land and grow rice and corn in rotation, and sell bananas, steamed cassava and sweet potatoes at the market. When we first met Tra five years ago in front of her old dilapidated wooden house she greeted us in excellent English and just wanted to practice her English as her goal then was to study English at university. She has been successful and is doing exactly what she wanted. ​Her elderly parents have poor health from a life of ongoing hard work and now neither can work much these days. Fortunately the eldest of their children are working and are able to help their parents a little.